We're kicking off our A Very Toddler Fourth Series with a fun and simple red white and blue sensory play activity this week! 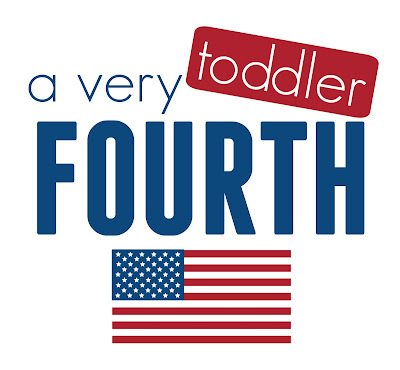 We'll be sharing 5 days of easy Fourth of July themed activities for toddlers along with Jenae at I Can Teach My Child. This jello sensory play activity was so fun to set up and a little bit sticky too! :) Have you ever tried jello play with your kids? 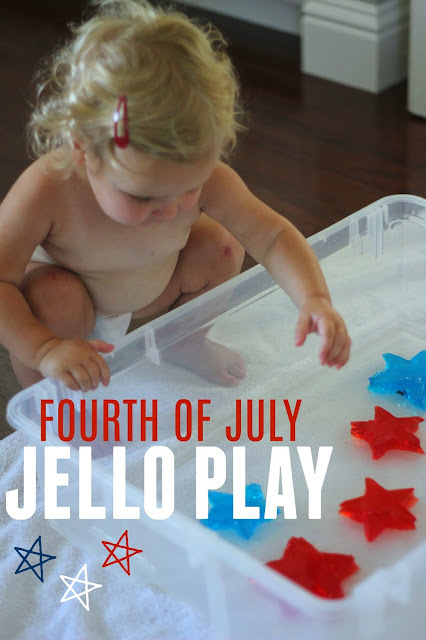 Here's what you need for our Fourth of July Jello Play activity. To get started we followed the directions on the jello boxes and made two pans full of jello- one blue and one red. Next, we used the star cookie cutters to cut out several jello stars and then we used the pancake flipper to move them into our big plastic tub. Now was the time for the fun to begin!! Once we put several jello stars in the plastic tub, we let my toddler start exploring the jello! Prepare yourself for a mess! I put a towel under our plastic tub to contain the mess a bit. After playing with the jello in the tub for awhile, I also gave my daughter the cookie cutters and let her explore the remaining jello with the star cookie cutters. It was fun to watch her explore the jello with her hands, feet, and pretty much her whole body. It was definitely quite a sensory experience! If you haven't tried this yet, go for it! You can find even more of our favorite patriotic activities on our Patriotic Crafts and Activities Pinterest board.